Sonoma Peak is the high point of the Sonoma Range in northwestern Nevada, near Winnemucca. With 3900’ of prominence, it is one of the more prominent peaks in Nevada. Since this is desert terrain, the best time for a visit is probably in late Spring or Fall. The area is remote, and access roads are very rugged, so be prepared to take to take care of yourself if visiting the area. We had scheduled a weekend of mountain climbing several weeks in advance, but as the weekend got closer, the weather forecast was looking lousy. After much discussion between Michael, Splattski, and myself, we finally settled on a trip to northwest Nevada, which had a decent forecast for Saturday. Maybe not the most glamorous destination, but I had cabin fever in a bad way, and the other guys were gracious enough to join me. So we made the 4.5 hour drive on Friday night, then headed for the Pole Creek trailhead on Saturday morning. We were able to follow the directions from SummitPost all the way to 6100’ elevation. Not bad considering there was a little fresh snow from the night before, and the roads were very rough. Instead of the “standard” north ridge approach up Sonoma, we decided on a loop hike instead, which would add two more peaks. The extras would be “West Sonoma Peak” (Peak 9192’) and “Broad Gulch Peak” (Peak 7355’). We started hiking at around 9:45 and followed the 4WD road up Pole Creek, then made our way up the slopes on the east face of West Sonoma. We took a leisurely pace through the sagebrush and patchy snow. The snow was mostly supportive, so not too much post holing. The fog got more and more dense as we climbed, so visibility was minimal. As we neared the ridge, the winds started kicking in, and we stopped for a quick bite to eat behind some rocks. But the wind didn’t let up, so we got moving again, and were on the summit of West Sonoma by about 12:45. The wind was blowing hard and cold on West Sonoma, so we didn’t linger long amongst the various junk left over from past telecommunication projects. Visibility was minimal and we were a little concerned about going down the wrong ridge. Fortunately, Splattski managed to get bearings from his GSP that improved our confidence levels. Soon we also came upon an ATV trail along the ridge that led us down to the saddle. From the saddle, we began the 800’ climb up Sonoma Peak. At this point, the clouds began clearing up a little so we could see the ridge above us. With no major obstacles, and we made it to the summit at about 2pm. We hung out for little while, eating a snack, reading the registers, and checking out the surprisingly rugged south ridge. Down-climbing that direction would have been tough, but our route was to the northeast, to make a loop back to the car. So down we went, move carefully over talus and a thin layer of snow. As we got lower, there was less snow, but now there was sagebrush hiding the talus. Needless to say, it was a pretty slow descent as we moved carefully trying to avoid twisting an ankle. Eventually, we made it to the base of “Broad Gulch Peak”, followed by a 400’ climb through wildflower to the highpoint of our last little peak of the afternoon. From here, we had a good view of the terrain we had covered over the course of the day. We descended the northeast slopes, through more talus, and then managed to intersect the 4WD road back to the rig, where we arrived at about 5:30. Round trip was just under 8 hours, 9.5 miles, and 4300' elevation gain. A nice adventure in a new area, with good friends, hard to beat! 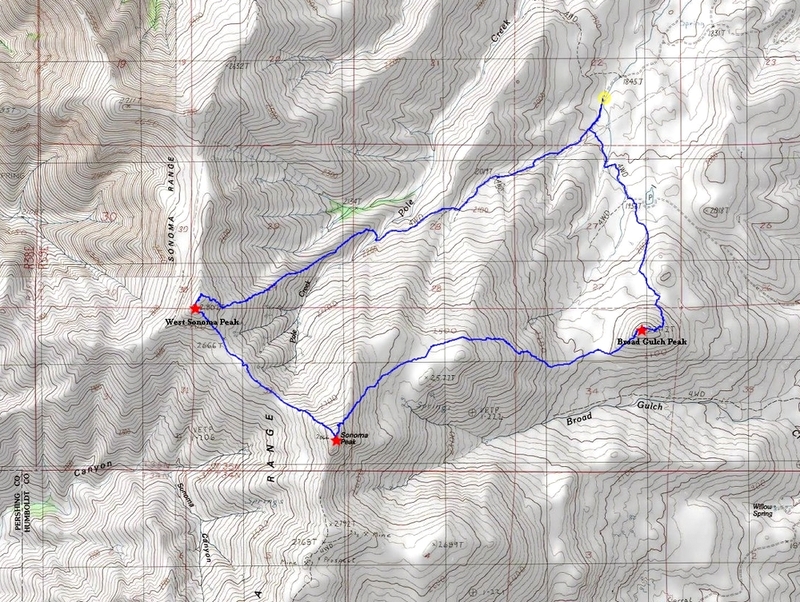 Map of our route, 9.5 miles and 4300' elevation gain round trip. We went counterclockwise. Start of the hike. Fresh snow forced us to stop driving at ~6100' elevation. Hawks nest with eggs, right next to the road. Start of the standard north ridge route of Sonoma Peak. But we continued west from here. Making our way up the east face of West Sonoma Peak. Thick fog as we neared the ridge. Splattski hidden in the fog amongst old equipment on the summit of West Sonoma Peak. Descending off West Sonoma, trying not to get lost in the fog. Finally, a break in the weather on the west ridge of Sonoma Peak. Crux of the climb, an easy scramble. Looking down on the rugged south ridge of Sonoma Peak. Nearing the summit of Sonoma Peak. Dave, John, & Michael on the summit of Sonoma Peak. Descending to the northeast from Sonoma Peak. A nice break in the weather on our way down. Heading toward "Broad Gulch Peak". Nearing the summit of "Broad Gulch Peak". Tired group on the summit of "Broad Gulch Peak". Sonoma and West Sonoma from "Broad Gulch Peak". Almost back to the car after a long but good day.